Ultrawideband (UWB) communication is a promising technology for wireless body area networks (BANs), especially for applications that require transmission of both low and high data rates with excellent energy efficiency. Therefore, understanding the unique UWB channel propagation characteristics around the human body is critical for a successful wireless system, especially for insuring the reliability of important vital sign data. Previous work has focused only on on-body channels, where both TX and RX antennas are located on the human body. 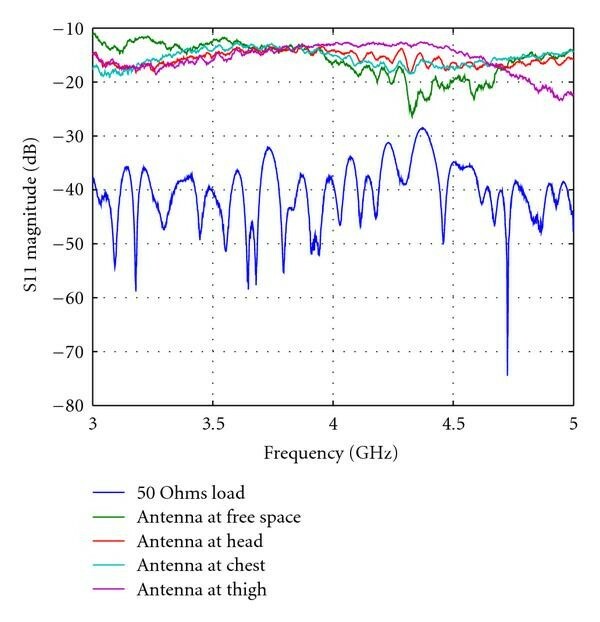 In this paper, a 3–5 GHz UWB channel is measured and analyzed for human body wireless communications. Beyond the conventional on-body channel model, line-of-sight (LOS) and non-line-of-sight (NLOS) channel models are obtained using a TX antenna placed at various locations of the human body while the RX antenna is placed away from the human body. Measurement results indicate that the human body does not significantly degrade the impedance of a monopole omnidirectional antenna. 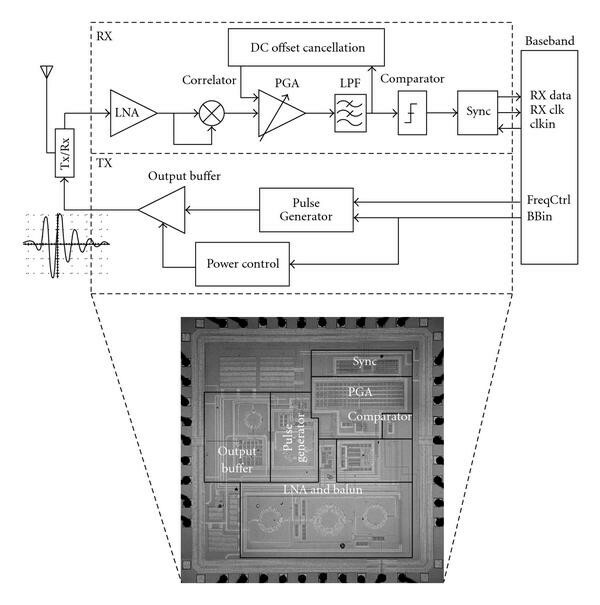 The measured path loss and multipath analysis suggest that a LOS UWB channel is excellent for low-power, high-data-rate transmission, while NLOS and on-body channels need to be reconfigured to operate at a lower data rate due to high path loss. Recently, there has been an increased interest in using body area networks (BANs) for health monitoring [1–7]. A variety of physiological electrical signals from the human body can be continuously monitored wirelessly, including brain waves (EEG or electroencephalography), heart health (ECG or electrocardiography), and muscle response (EMG or electromyography). For a real-time vital sign monitoring system , as shown in Figure 1(a), a single (or multiple) wearable sensor node with a wireless transmitter is attached to a patient, while the receiver is attached to some nearby fixed location (i.e., wrist watch or ceiling). The sensor captures the real-time physiological signals, activating the transmitter that sends a low-data-rate signal to the receiver alerting a remote clinician through cellular or internet networks. Through this wireless body sensor network, disease prevention can be improved with this continuous real-time diagnosis, thus reducing the onset of degenerative diseases and healthcare costs. Body area networks for health monitoring: (a) low-data-rate transmission (b) high-data-rate transmission. A high data rate is not typically an important concern for body area networks, as sampling frequencies of front-end sensors is typically less than 1 kHz. For example, a heart reading using ECG requires at most 12 kbps or 12 b at 1 kHz. However, for body sensor applications that require tens or hundreds of sensing channels , a large bandwidth is necessary. One example is a handheld, wireless ultrasound module with hundreds of ADC channels, which need to send several megabits of data. Another example is in next-generation brain implants, which will require hundreds of cortical implant channels streamed wirelessly to a stationary receiver . This large communication bandwidth will also be needed for an application where BAN data may firstly be stored locally on the sensor node, such as in a local data storage memory. Then when the patient goes to the hospital, the doctor can read these data through high-data-rate transmission and make a thorough diagnosis, as shown in Figure 1(b). Traditional narrowband wireless protocols, such as MICS (medical implant communications service), Zigbee, ISM, and Bluetooth standards [4, 5], suffer from large power consumption and low data rate, as listed in Table 1. Unlike these traditional narrowband systems, ultrawideband (UWB) wireless sensors operate with a large bandwidth (3.1–10.6 GHz) and a low maximum transmission spectral density (−41.3 dBm/MHz). According to Shannon-Hartley theorem, with an ultra-wide bandwidth, high data rate can be achieved with low transmitted power in UWB. Power consumption is also a critical requirement for body area networks, as patients may choose to not adopt such body sensors if the sensors need to be recharged frequently. Furthermore, low power consumption results in a smaller battery size, significantly reducing sensor cost and form factor. Consider a 3–5 GHz impulse radio UWB (IR-UWB) transceiver that we developed, shown in Figure 2. An IR-UWB transceiver does not require DAC, PLL, or PA. Here the transmitter consists of only a pulse generator, an output buffer, and a power control block . A configurable data rate can be easily realized by changing the pulse repetition rate. The duty-cycled characteristic of the transmitted signals is employed to turn off the output buffer during pulses intervals, further lowering the power consumption. Measurement results show that the power consumption of the transmitter is only 400 μ W and 4.44 mW with data rates of 1 Mbps and 100 Mbps, respectively. Meanwhile, the receiver employs a noncoherent architecture, consuming 13.2 mW with a data rate of 100 Mbps. Table 1 summarizes the measurement results of the proposed UWB transceiver and two off-the-shelf chips (TI cc1101 and TI cc2500). Impulse radio UWB transceiver architecture. Knowledge of the channel model for UWB transmission is critical for any robust transceiver system. Moreover, body area networks exhibit unique radio propagation characteristics combining line of sight, creeping wave, multiple reflections from surrounding environments, and diffraction around the human body. Ever since the FCC released unlicensed spectrum for UWB, several previous works on UWB channel modeling have been published. Molisch et al. developed an IEEE 802.15.4a channel model for various low-rate UWB applications, where the body area network channel model is analyzed using a finite difference time-domain (FDTD) simulator with antennas moving around the human body. Wang et al. also used FDTD method to simulate various body postures based on a realistic human body model. Unfortunately, these numerical approaches neglect considerations of the surrounding environments, which are the main sources of multipath. Furthermore, the previous investigations only considered data transmission with both TX and RX antennas on the human body, which is not the dominant usage model. In this paper, we present a complete UWB channel model that not only considers on-body UWB propagation but also extends to include LOS and NLOS channel measurement, using a TX antenna placed on the human body and a separate RX antenna located externally. Section 2 introduces the measurement setup of this work, Section 3 discusses the measurement results and provides a thorough analysis on different channels, and Section 4 draws a conclusion. In this work, the UWB radio channel measurement is performed in an EM-shielded lab with a height of 3.5 m. The lab resembles an ordinary room with concrete walls, ceiling, desks, and chairs. When the door is closed, the lab is protected from EM interferences by metallic panels behind the walls and ceiling. This enables accurate estimation of local multipath propagation, with sufficient interference rejection. Channel measurements can be conducted in the time domain based on impulse transmission or the frequency domain using a frequency sweep technique . In the former setup, as shown in Figure 3, UWB impulses are generated by a pulse generator and transmitted through an antenna. After wireless propagation, the impulses are received by an RX antenna and sampled by an oscilloscope, where subsequent time-domain algorithms are performed in order to calculate the path loss and power delay profile (PDP) . In the latter setup, a vector network analyzer (VNA) is employed that captures the frequency response of the UWB channel as a S21 parameter, followed by generation of a channel impulse response (CIR) in the time domain, obtained by performing an inverse Fourier transform (IFT). In this work, a VNA-based measurement setup is employed. The VNA (HP 8520ES) is used to capture 1061 data points between 3 and 5 GHz, providing a frequency-domain resolution of 1.25 MHz. As shown in Figure 4, the following three conditions are measured. Frequency-domain measurement setup: (a) line-of-sight; (b) non-line-of-sight; (c) on-body. There is no object obstructing the TX and RX antennas. The TX antenna is placed on the head, chest, and left thigh of the human body while the RX antenna is placed at the same height off the human body. The transmission between the TX and RX antennas is interrupted by the human body. Both TX and RX antennas are placed on the human body. The RX antenna is worn on the left wrist while the TX antenna is able to freely move around. The antennas used in the measurement are monopole omnidirectional antennas from 3–5 GHz, manufactured by Fractus Corporation. Calibration is performed to eliminate the loss of the cables and connectors. The measured antenna return loss (on and off the human body) is shown in Figure 5. As observed, the antenna shows excellent impedance matching on and off the human body with the return loss (S11) below −10 dB across the entire 3–5 GHz. Note that the antenna return loss near the human body is different from free space, as the antenna characteristic impedance is changed by the high dielectric permittivity and conductivity of the human body tissues . Measured return loss of the antenna. where is the speed of light, is the distance between the TX and RX antennas, and is the path loss exponent, whose value is normally 2 for propagation in free space. While the frequency dependence of the path loss is usually ignored in narrow band systems, it cannot be ignored in UWB systems due to the large bandwidth. Figure 6(a) shows the measured S21 of the channel when the distance is 3 cm (the calculated free space frequency-dependent loss is also plotted as a comparison). As observed, the frequency response of the LOS channel is different from free space transmission because of the absorption and reflection off of the human tissue, as well as the surrounding environments which are also frequency dependent. As the transmission distance extends to 1 m, the multipath signals increase, such that the LOS path loss is less than the free space path loss, as shown in Figure 6(b). Figure 6(c) shows that for the measured S21 of a 1 m NLOS channel, the path loss is greatly worsened, as the UWB signal is unable to transmit through the human body. In this NLOS situation, the measured received power comes predominantly from the reflections of the surrounding environments and the diffracted signal from the human body. Finally, on-body channel characteristics are also measured, as in Figure 6(d), showing that the left wrist to right thigh channel exhibits larger path loss than left wrist to left thigh channel, as the transmission distance is increased. Frequency-dependent characteristics of UWB channel: (a) LOS at 3 cm; (b) LOS at 1 m; (c) NLOS at 1 m; (d) on-body channel. where is the number of the swept frequency points and is the frequency response S21 of the channel measured by a VNA. In Figure 7(a), a linear regression fit is performed in order to calculate the path loss exponent in a LOS channel measurement. The far-field path loss exponent in this work is different from the previous works [9, 10, 14, 16, 17], because only the TX antenna is put on the human body and the reflective environments are also considered in this LOS measurement setup. Table 2 lists the measured results and the comparison with previous works. The standard deviation of the normal distribution is also calculated in order to improve the accuracy of (2), as shown in Figure 7(b). Figure 7(c) shows the distance-dependent path loss in an NLOS measurement. The NLOS channel path loss does not show a linear-logarithmic characteristic as the LOS channel; instead, the path loss changes slightly as the distance extends. The reason is that when the human body interrupts with the transmission channel, the area of the human body that interrupts the signal becomes small relative to the distance between the antennas, such that the diffracted signal becomes stronger . Note that the path loss of the on-body channel is much larger than the LOS channel and comparable with that of the NLOS channel, as can be seen in Table 3. Comparison of parameter values for distance-dependent path loss model. Path loss of on-body channels. Distance-dependent path loss: (a) LOS path loss; (b) cumulative probability of far-field LOS path loss; (c) NLOS path loss. where is the UWB channel impulse response (CIR) in the time domain and is the measured UWB channel frequency response. Hermitian signal processing is employed to obtain a real-valued CIR by zero padding the lowest frequency down to DC, taking the conjugate of the signal, and reflecting it to the negative frequency . Figure 8 shows the power delay profile of both LOS and NLOS channels after placing the TX antenna on the chest. As observed, the received power is greatly reduced due to the LOS interruption caused by the human body within the NLOS channel. However, because of the diffraction around the human body, the RX antenna still captures some detectable power at delay times of 2.6 ns and 4.4 ns in the NLOS channel at distances of 50 cm and 1 m, respectively. Another important phenomenon is that in a LOS channel, the received direct path power reduces by 7.4 dB when the distance extends from 50 cm to 1 m. In an NLOS channel, the received diffracted power reduces by only 3.3 dB. This manifestation occurs because the area of the interruption caused by the human body becomes relatively smaller as the distance is increased, coinciding with the results of Figure 7(c). Power delay profile when placing TX antenna on the chest: (a) LOS at 50 cm; (b) NLOS at 50 cm; (c) LOS at 1 m; (d) NLOS at 1 m.
Maximum delay spread is the time difference between the arrival of the first and last significant signals. Among these, RMS delay spread is the most commonly used parameter because of its effect on the bit error rate and maximum data rate. Figure 9 shows the relationship between RMS delay spread and the minimum detectable power threshold for a 1 m transmission distance. As observed, the number of significant paths increases exponentially with the power threshold in LOS, NLOS, and on-body channels. However RMS delay time does not show the same characteristic, as the contribution of newly detected paths declines as the threshold increases . An NLOS channel suffers more severe multipath effect and larger RMS delay spread than a LOS channel because of the interruption of the human body. Figures 9(c) and 9(d) show on-body channel measurement results with both TX and RX antennas placed on the human body. The multipath number and RMS delay time in a left wrist to left thigh channel are less than those in a left wrist to right thigh channel in low threshold detection because of the shorter transmission distance. However, the RMS delay spread is less significant as the threshold increases. This phenomenon is likely because both of these two channels share the same surrounding environments, for example, the same distance away from the floor. The cumulative probability of the RMS delay spread with a threshold of 20 dB is shown in Figure 10. Table 4 summarizes the average value and the standard deviation ( and ) of the lognormal fitting model. Lognormal fitting model of the RMS delay spread. Mean RMS delay spread versus threshold: (a) multipath number at 1 m; (b) RMS delay time at 1 m; (c) multipath number at on-body channel; (d) RMS delay time at on-body channel. Cumulative probability of the RMS delay spread fitted to lognormal delay with 20 dB threshold (a) LOS (b) NLOS (c) on-body. Ultrawideband communication is a promising technology for next generation body sensor networks due to its potential for both low power and large bandwidth, currently unavailable using conventional narrowband systems. In this paper, both line-of-sight (LOS) and non-line-of-sight (NLOS) channels with various TX and RX antennas placed near the human are characterized. The frequency- and distance-dependent characteristics of a UWB channel are analyzed in this paper, where an NLOS channel is shown to have larger path loss than a LOS channel due to the physical interruption of the human body. Moreover, the path loss of an on-body channel is comparable with an NLOS channel. RMS delay spread is presented which provides an intuitive inspection of the multipath richness of a variety of channels. According to the experimental and analytical results, UWB systems with high data rate will require LOS channel characteristics. For sensor network application where only low-data-rate transmission is needed, NLOS and on-body channels can exhibit good performance using UWB.